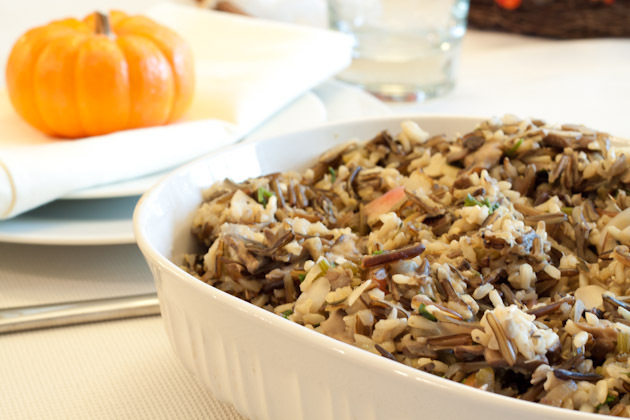 This gluten-free rice stuffing is a perfect, healthier version of traditional stuffing. 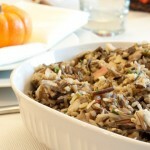 The mushrooms and thyme combine so nicely, and the wild rice gives the dish a perfect stuffing like texture. Melt 1/2 tablespoon coconut oil in a large saucepan over medium heat. Add onions and saute until very tender and caramelized, about 25 minutes. Transfer onions to large bowl. Melt remaining 1/2 tablespoon coconut oil in the same pot over medium-high heat. Add celery, mushrooms, and half of the thyme. Saute until mushrooms are deep brown, about 12 minutes. Once complete, remove from the saucepan and add to bowl with onions. Season with salt and pepper and set aside. I used Herbamare (flavored sea salt) but any salt will do the trick! Bring broth, remaining thyme and sage to boil in the same saucepan. Mix in wild rice, cover and return to boil. Reduce heat and simmer 25 minutes. Mix in short-grain rice; cover and simmer until all rice is tender and almost all liquid is absorbed, about 40 minutes longer. Stir in caramelized onions and mushrooms, remaining sage, pear, apple, seeds, almonds and parsley. Cover and cook for 5 minutes, stirring often. If using for a turkey, stuff as much rice mixture as can fit in that bird, and bake extras in a casserole dish for 30 minutes at 350F. I like to do this after the bird is done and has to sit for 30 minutes or so to rest. If you’re not using for a turkey, enjoy as is, or cook in a casserole dish using instructions in step 8 above.